What is the Invisi-Fast Hidden Deck Fastener? Are you tired of having to choose what fastener to use depending on the deckboard you are using? Worry no more. 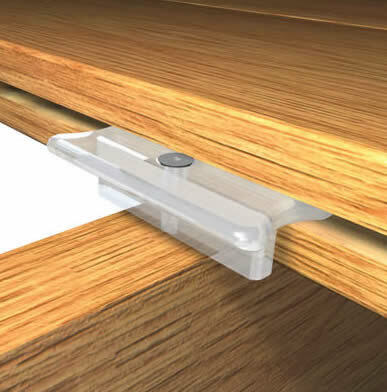 The Invisi-Fast Hidden Deck Fastening System combines a practical and cost efficient way of fastening virtually every kind of deck board. 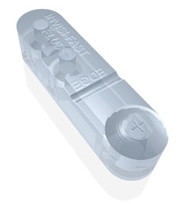 All of the Invisi-Fast fasteners are produced from extremely tough and durable Polycarbonate resins. There are no comparisons with other kinds of plastic fasteners, the Invisi-Fast Hidden Deck Fastening System is the strongest on the market. We know with all the different types of fasteners in the market today, choosing the correct fastener may be difficult. You have companies telling you that their fasteners work but they don’t. Others are telling you they are strong and durable but they’re not. With the Invisi-Fast family of deck fasteners, you can be assured that you are getting a fastener that is designed to work with your deckboard and a fastener that is proven to be the strongest in the market! Whether you are using a pre-grooved deck board, grooving your deckboards on the jobsite or using solid edge deckboards, Invisi-Fast has all the options for you. 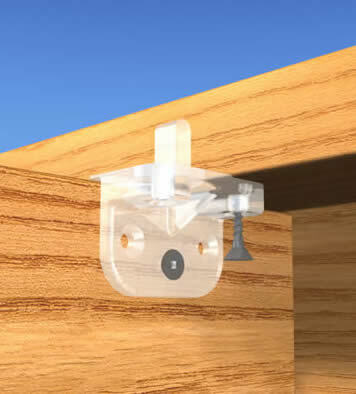 With the Original fastener, you can fasten all the solid edge boards that run perpendicular to the joist. If you are going to build your deck with the deckboards running on any angle to the joist you can choose the Angle fastener. Then we have the Biscuit fastener for all of your grooved board applications. 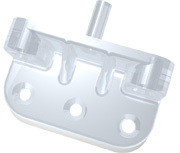 One of the greatest advantages of the Invisi-Fast is the Original Fastener with a No-Spacer option(the Start/Stop Clip). It allows the user to eliminate face screwing the deck. You will use them around the perimeter and for the first and last board fastening. You can use them to secure around posts and beams. You will even use them to construct your stairs. They are available in 36, 100 and 500 piece count kits. Each kit comes with the appropriate number of fasteners, screws, a driver bit for the screws and installation instructions. You will find many new ways to use the Invisi-Fast No-Spacer with every deck job you do. Hot Products for Grooved Deck Boards!! The TXB and the NMB fastener have been hot sellers all year. It is from their ease of use and substantial strength that is drawing customers to them and bringing them back. These fasteners are available in 100 piece and 500 Piece Kits. If you are one of the many contractors or consumers to step into the realm of using steel rather than wood joists, please choose Metal Joist Screws from the drop down menu when ordering. Please note that due to the style of screws we are unable to preset these screws. A Better Way to Fasten Deck Boards An article from ExtremeHowTo.com on using Invisi-Fast Biscuits to fasten deck boards. Building A House This is a blog about the adventures of a couple building a split-level house and making it into a home. 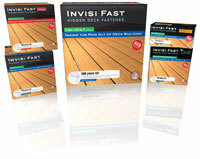 Invisi-Fast Hidden Deck Fastening Videos of the Original/Angle Deck Fasteners. See in detail the featues and advantages of Invisi-Fast Hidden Deck Fastener. See a real-world example of the Invisi-Fast Hidden Deck Fastener being installed. Under deck design helps prevent premature wood rotting around fastener while creating a clean look from above. Screws into the side of the joists preventing premature wood rotting. Invisi-Fast™ deck fasteners cost less per square foot than most other hidden deck fastening systems. Hidden Deck Fastener Spacing Options for all types of Decking! Our INNOVATIVE sizes of Invisi-Fast Hidden Deck Fasteners give you the flexibility you need to properly space ALL types of Decks. Sizes include 1/8", 3/16", 1/4" or no spacer allowing you to gap the deckboards. Introducing a NEW way to fasten Angle Decking! The Solution for Above Deck Installations! The easiest way to install deckboards from above. 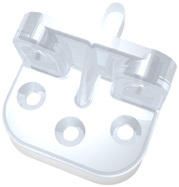 Our simple Flip, Attach & Flip method ensures accurate and secure attachment when used with Invisi-Fast with spacers. Available in Five different styles: Invisi-Fast PW(formerly NM), TT, TXB, NMB, PC1, TD and TQ(WITH EITHER 1/8" OR 3/16" SPACING). Fasten GROOVED deck boards from above with our unique Biscuit fastener. The Invisi-Fast Biscuit Fastener fits perfectly into supported grooved deck boards or create your own groove on any solid plank with unbelievable holding power. Fastens easily from above the deck. When ordering, specify 1/8", 3/16", 1/4" OR NO-spacer. Kits available with Ceramic Coated,Stainless Steel wood screws. or Stainless Steel screws for metal joists. Kit includes 88 pieces with a spacer, 12 pieces without a spacer (for first & last board fastening), 300 ACQ Compatible Square Drive Deck Screws, 1 Square Driver. Kit includes100 pieces with a spacer, 12 pieces without a spacer (for first & last board fastening), 300 ACQ Compatible Square Drive Deck Screws, 1 Square Driver. Kit includes 100/500 pieces, 100/500 ACQ Compatible Trim Head Screws, Driver Bit.. Kit includes 360 pieces with a spacer, 40 pieces without a spacer (for first & last board fastening), 1200 ACQ Compatible Square Drive Deck Screws, 1 Square Driver. Kit includes 440 pieces with a spacer, 60 pieces without a spacer (for first & last board fastening), 1500 ACQ Compatible Square Drive Deck Screws, 1 Square Driver.